Coltsfoot has been used for over 2,000 years to improve breathing and treat lung ailments - often smoked, made into tinctures, or even chewed. Learn more here. Coltsfoot, or Tussilago farfara, is indigenous to Europe and northern Asia, and has been naturalized in North America. This herb, often confused with dandelion, has been used for at least 2,500 years as a remedy for a variety of respiratory ailments, and it is commonly found growing along roadsides, on coastal ridges, and in open areas. Relieving congestion. Its antitussive and expectorant actions help clear the airways and is a popular remedy for bronchitis, cough, laryngitis, and pneumonia. The anti-inflammatory properties of coltsfood are also used for soothing minor skin injuries and irritation. 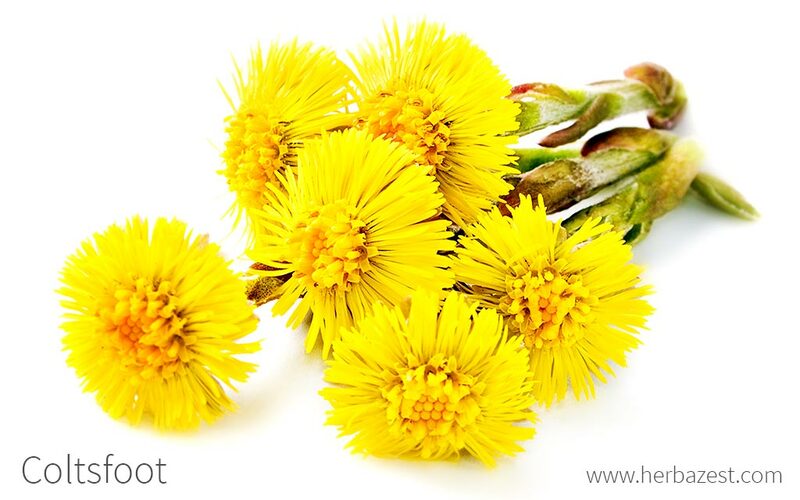 The health benefits of coltsfoot can be attributed to the combination of mucilage, flavonoids, and polysaccharides. The flower buds of coltsfood also contain tussilagone, a sesquiterpenoid that has shown a variety of pharmacological activities, including anti-inflammatory properties. It interacts with a number of naturally occurring chemicals in the body, particularly prostaglandin, a fatty acid related-substance which stimulates muscle contraction and control inflammation processes. Caffeoylquinic acids are organic compounds, abundant in coltsfoot, contribute to the antitussive, expectorant, and anti-inflammatory properties of the herb, with an additional hepato stimulant effect than may cause toxicity if consumed in large doses. On the other hand, mucilage works by forming a protective layer over the inflamed mucous membranes of the throat and mouth, counteracting the urge to cough. Extracts of the whole coltsfoot plant have been shown to increase immune resistance. Additionally, the flavonoids contained in coltsfood have shown antioxidant activity, preventing the damage caused by free radicals to the heart and the liver. Flavonoids are also responsible for the anti-inflammatory and antispasmodic characteristics of coltsfoot. Passion flower and saffron also exhibit antitussive and antispasmodic properties. While coltsfoot is still used to treat respiratory ailments, it has decreased in popularity due to the pyrrolizidine alkaloids contained in its flower heads and roots. These are toxic substances used by plants and animals as a method of self-defense, in order to deter natural enemies. Due to this poisoning chemicals, if taken in high doses, coltsfoot can be fatal. Gastrointestinal symptoms are usually the first sign of intoxication, and consist predominantly of abdominal pain and vomiting. When ingested in small doses; however, no toxicity has been observed. Pregnant women should not consume coltsfoot. Pyrrolizidine alkaloids may damage the liver in large amounts. Coltsfoot is mainly used for making medicines. It can be prepared into infusions and tinctures, and mixed with honey to sweeten it. The herb also can be found in the form of liquid extracts and capsules made from the dried leaves. Infusion. The dried leaves of coltsfood can be brewed and taken orally in order to help relieve congestion. Poultice. The dried leaves can be re-hydrated in water and then applied topically for relieving skin complains, such as minor wounds and irritations. Liquid extract. This concentrated form of the herb needs to be diluted in a glass of water and taken orally as a remedy for bronchitis, cough, laryngitis, and pneumonia. Tincture. Product of an alcohol maceration process, this form of coltsfood provides all the health benefits of the herb, and it requires to be diluted in water before consumption. Capsules. Packaged in convenient doses, the dried and ground leaves of coltsfood can be taken as daily supplements for the treatment of respiratory illnesses. The loose dried leaves of coltsfoot are available year round in most herbal shops and specialty health stores, for the ones who prefer to prepare home remedies for cough relieve and other respiratory conditions. In remedial forms, coltsfood can be easily purchased online; however, they also can be found in some herbal shops and specialty health stores. Coltsfoot supplements are also readily available, mostly through online retailers, in tablets or capsule form. Coltsfoot is a resilient species, which grows wild in cool, wet areas, like stream banks, coastal ridges, and embankments. However, some basic requirements are necessary in order to cultivate this medicinal plant in a garden. Coltsfoot prefers moist, loamy, limestone soils and full sun. Fresh coltsfoot seeds are able to propagate at constant temperatures ranging from 41-86°F (5-30°C), but they thrive if kept between 50-77°F (10-25°C). Coltsfoot grows best in soils with pH 4.6 - 10. Coltsfoot is a perennial herb that grows to around one foot (30 cm) tall. It has flowering stems with purple scales and yellow-gold flowers. One of the plant's most striking features is its heart shaped leaves, which are deep green and smooth on the upper side, but significantly lighter - nearly white - on the other side. The stems are covered by a waxy layer that can easily be removed by hand. Since they usually spread through rhizomes, they are commonly found in the wild, forming colonies of 10 - 20 plants. Coltsfoot (Tussilago farfara) belongs to the large Asteraceae family, which comprises about 1,100 genera and 20,000 species, including well-known herbs such as artichoke (Cynara scolymus), dandelion (Taraxacum officinale), lettuce (Lactuca sativa), and marigold (Tagetes erecta). Coltsfood is the only species in the Tussilago genus, with not known varieties or related species. However, coltsfoot is often mistaken for the similar-looking butterbur (Petasites hybridus) and winter heliotrope (Petasites fragrans), which do not share the same medicinal uses and are potentially toxic. Coltsfoot has been used traditionally for over 2,500 years, and is still considered a valuable herb for its medicinal uses. Dioscorides, a 1st-century Greek physician, recommended it for dry coughs. During the following centuries, it was commonly smoked to promote easier breathing and lessen the symptoms of lung ailments. Coltsfoot is technically considered a weed that grows wild in North America, so there are no concrete numbers about the economic value of coltsfoot. The biggest industry for coltsfoot, however, is medicinal. Coltsfoot is often used in herbal supplements or taken as an extract for various ailments.